I recently downloaded Visual Studio 11 Beta in order to take a look at the new 4.5 .Net Framework and play around with its new features. 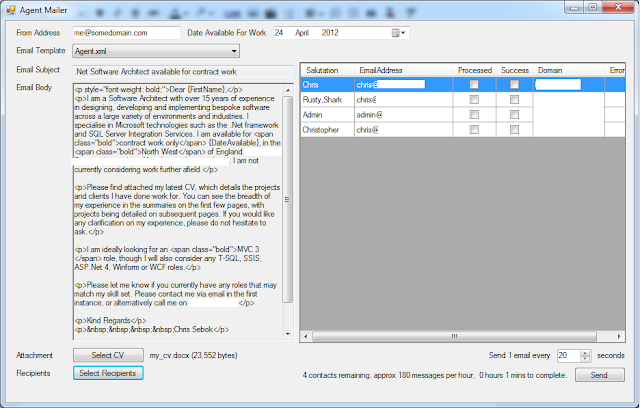 I decided to take the opportunity to build a "quick" app that I've been meaning to build for a few years; a single form Windows Client that allows me to send out an email merge to the 1,400 agents I have in my outlook contacts list, to let them know I'm available for work. Before now, every time I've needed to send an "I'm available!" email, I've copied + pasted the same email a number of times, attached my CV and BCC'd 100 or so agents at a time (too many and Outlook just falls over). Not only is it a massive waste of my time, but it's very error prone and not a very friendly way of doing things. Unfortunately, the mail merge feature of Word has its limitations, so I've had to look in to my own solution.